Packaging Dimensions 2.1 in. x 1.7 in. x 1.7 in. I used this clamp with the 500 volt, 50/50uf capacitor. I was able to drill two holes and fasten it to the chassis with 6-32 screws. It is very sturdy, and holds the capacitor tightly in position. Awesome product, couldn't get a particular multi section in twist lock, so I used this to mount it vertical in a vintage amp to maintain that original look. Great price and fast shipment. 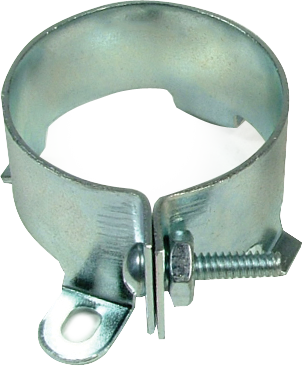 This clamp was part of a larger order, which was handled promptly by AES. With delivery taking only 11 days to my location in Australia. I've been using these 1 3/8" can capacitor clamps since 2007 for all the tube audio equipment I build. They work great with the JJ Electronics Can Capacitors that I use on every tube power supply, amplifier and tube phono stage preamp that I've built. They work great and look great. Just make sure you get the correct size clamp for the can capacitor that your using. What can you say about a clamp? These work great! Asked by Anonymous on January 16th, 2017. The distance between the two mounting holes is labeled B in the above spec sheet.